If you’ve ever watched ANZAC Day parades, commemorating the Gallipoli landing of 1915, you would have seen squadrons, platoons, companies, regiments, marching bands – a whole range of armed forces – proudly marching and displaying their medals. Even more noticeable, as war veteran numbers dwindle, are the family members who are also proudly displaying their relatives’ medals. Did you know that there’s a protocol for the correct wearing of medals? Medals displayed on the left breast indicate the true owner and actual recipient of the medal, with the ownership of those medals remaining with that person, even in death. When medals get passed down to the next generation, those medals can only be worn on the right breast. The highest military honour introduced by Queen Victoria on 29th January 1856 for “valour in the face of the enemy” during the Crimean War, is the Imperial Victory Cross medal (Imperial VC). And it ranks higher than all other orders, decorations and medals. Even the most senior military officer must salute a VC recipient, no matter what rank, as a mark of respect. 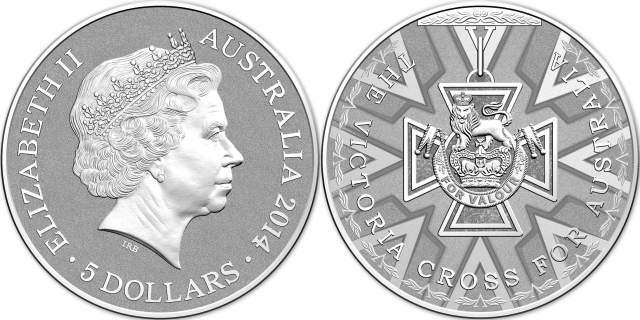 In 2000, the Royal Australian Mint released a memorial coin to mark the 100th Anniversary of the first Imperial Victoria Cross awarded to an Australian. The medal was awarded on 24th July 1900 to Major General Sir Neville Reginald Howse VC KCB KCMG for the rescue during the Boer War of a wounded man, despite being under attack himself. To date, the Imperial VC has been awarded 1,357 times – with only 14 being awarded since the Second World War – 10 within the British Army and 4 within the Australian Army. However, since 1856 to current day, 100 Australians have been awarded the Victory Cross, and to mark this historic occasion, The Royal Australian Mint recently released (via ballot) a $10 antique copper coin (limited to 5,000). The coin is part of their Anzac Centenary Coin program, with the VC recipients names displayed in micro text. The Victory Cross for Australia was introduced in 1991, replacing the Imperial VC awarded to Australians and is now the highest Australian military award. The wording for this award is “other persons determined by the Minister [for Defence] for the purposes of this regulation” – in essence not restricted to members of the Australian Defence Force but possibly open to police personnel and even civilians. •	In 2009, to Trooper Mark Donaldson of the Special Air Service Regiment, who rescued an interpreter under heavy enemy attack in Oruzgan province, Afghanistan on 2nd September 2008. •	In 2011, to Corporal Ben Roberts-Smith MG of the Special Air Service Regiment, after destroying two Taliban machine gun placements, during the 5-day Shah Wali Kot Offensive in Kandahar province, Afghanistan on 11th June 2010. •	In 2012, to Daniel Keighran of the 6th Battalion, Royal Australian Regiment for drawing enemy fire away from an injured colleague and those tending to his injuries, in the Battle of Derapet in Oruzgan province, Afghanistan in August 2010. •	In 2014, posthumously to Corporal Cameron Baird MG of the 2nd Commando Regiment, who was killed in Afghanistan in 2013 and previously awarded the Medal for Gallantry in 2007, for his part in a Taliban stronghold search and clearance operation. 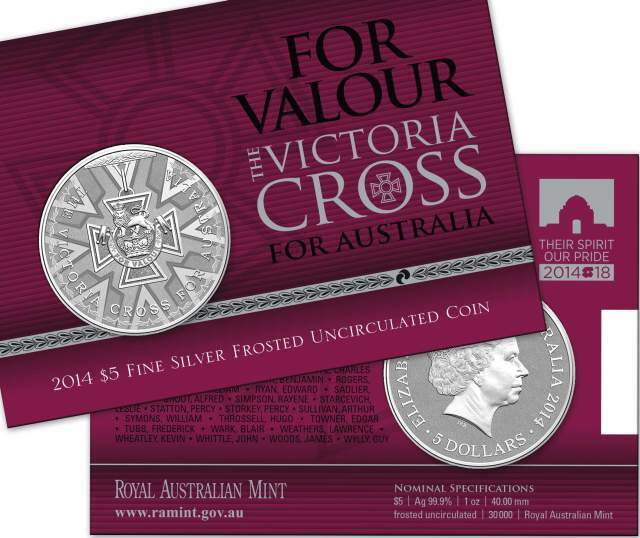 Also part of the Anzac Centenary Coin program, the Royal Australian Mint has now released a five dollar 1 ounce fine silver frosted uncirculated coin to commemorate the 100th Australian receiving the VC (combined total of both the Imperial VC and the Victoria Cross for Australia). The reverse coin design depicts the Maltese Cross, with a lion guardant above a crown symbolizing the British Royal Family. The obverse depicts the portrait of Queen Elizabeth II, designed by Ian Rank-Broadley. The coin is issued at $70 with a capped mintage of 30,000 coins. ‹ What are Australian Coins Made Of?